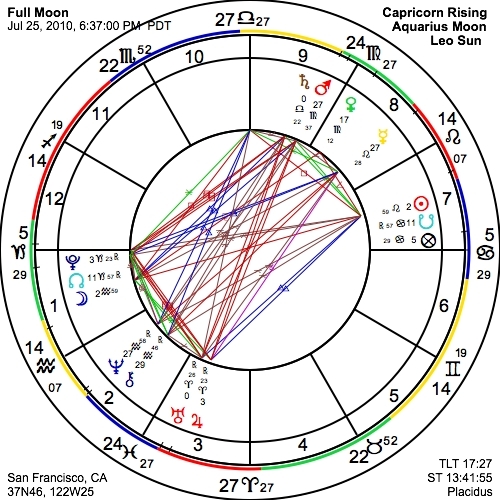 This eclipse chart is powerful just because of the nature of an eclipse, being a particularly strong New Moon where the effects last for six months or more. 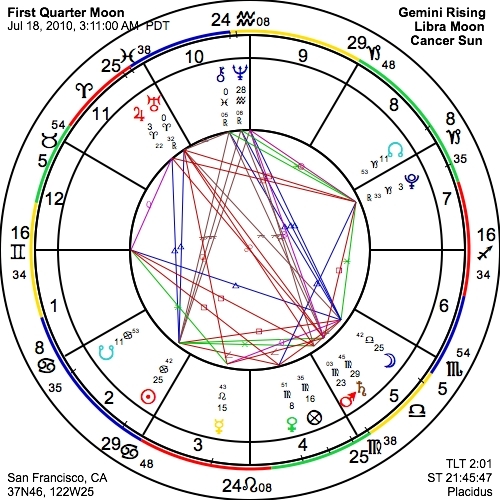 This New Moon is in Cancer and there are implications for a fresh start with home and family and whatever we consider our community or tribe. The Sun and Moon aspect Saturn and Mercury just as Mercury comes to an exact inconjunct with Pluto, so that Pluto‘s square with Saturn is becoming more pronounced. This square, further emphasized by the 21st when Saturn enters Libra, predicts that radical changes and challenges are on the way this month. This is traditionally a time of minor crisis, of seeing what part of the impulse from the New Moon is truly viable. The tension of the square between Sun and Moon makes itself felt, and adds to the inherent tension in this month’s configurations. The Sun aspects Saturn, and the Mars/Saturn midpoint even more exactly, as Mars begins its conjunction with the planet of limitation and of holding back. Saturn opposing Uranus re-emphasizes the polarity of opposite sides that we see all around us in the political arena, as well as in our own lives. Reconciling these contrary impulses by rising above them is the key. Once again, this configuration is an extremely strong one with the Sun and Moon acting as trigger for the Cardinal T-square now completely formulated since Saturn has moved into Libra. Mars is also close to conjuncting Saturn, perfecting in a few days time on the 31st. Rather than seeking to escape the consequences of our actions, we must strive to find a way not around them but through. Only by examining our innermost truth with courage and conviction will we be able to accept necessary transformation and begin to move on with our lives. It has been famously and extremely well said that everybody wants to go to heaven but nobody wants to die. But spiritual death and subsequent re-birth is not the worst thing that can be imagined; stagnation is worse. NOTE: In this article, I have chosen to write about the Solar Eclipse on July 11th from a personal-spiritual perspective. Please know that there are other vantages from which to view its influence and numerous ways this event will be impacting us globally, economically and politically to name a few. It may also trigger intense weather, hurricanes, earthquakes or other such events. The impacts of the Eclipse will be felt for 30-90 days. The Solar Eclipse on July 11th is occurring in Cancer at 12:41 pm, which rules home, among other things. And while it rules our physical home, the place where we live, in a Universal sense it also rules the intended home for our own higher consciousness. This higher part of each of us has a very specific agenda in this regard and that is to descend into its home in the physical realm, specifically in our body. I feel this Solar Eclipse will create openings for this occur. As I read this, and consider its meaning, I could feel my own higher Self quicken within me as the desire to give this Self a home in my own body seemed to become more real. I saw anew that the fulfillment of Life is the decent of Spirit into Matter. And for each of us this manifests as our Soul presence residing, and finding its home, in our body. So what does this mean? First is to awaken to the reality that our body is our home. Then to create a place within our being to be a home that is able to carry the Light of our own Soul. This is our foundation, which we must have if we are to heal feelings of separation and isolation. In thinking about this, I wonder if how “at home” we feel, in a more general sense, is in direct relation to how fully incarnated our Soul presence is. If you feel a strong urge to be a part of the healing that is needed on the planet now, though are not sure what that is or how to make that happen, could it be that your primary task is to welcome yourself Home? Could it be that the Earth herself, being the benevolent Mother that she is, is allowing the injustices being done to her to help us awaken out of our slumber? Is the pain and frustration we feel a way to shock us into awakening out of our slumber so that we hear the call of our own Soul? And that this will in turn empower each of us with the resources and awareness that we must have to respond to her call for help? A friend once said to me “it is too great a task to be born un-concenting”. Did we all sign up for just this? I believe we did. In order for us to fulfill our purpose, of which a part may well be to assist the Earth in Her own healing, must we first begin the process of healing our own separation from our Soul? What could be more healing, and empowering, than that of welcoming our own Soul into our bodies, and thus into our lives? Could it be that as we each do this to greater and greater degrees (as I am quite certain it happens in increments) that the Earth will also heal and become whole? It is said that we are One…could we all be a part of her destiny and perhaps even Soul? And that as we each tend to our own Soul-Self becoming at home in our body, thus becoming more whole, that the Earth will as well? These are big concepts, I know. Maybe even a little wild. Yet these are the thoughts I find myself thinking as we enter the energies of this Solar Eclipse~New Moon in Cancer. Perhaps they trigger something deep within you? This eclipse crosses directly over Easter Island. The chances of this are truly astronomical! And while the scope of this article is not to delve into the possible meaning of this, I can’t help but revel in the fact that secrets these ancient standing stones hold may be activated in the collective psyche in some way. 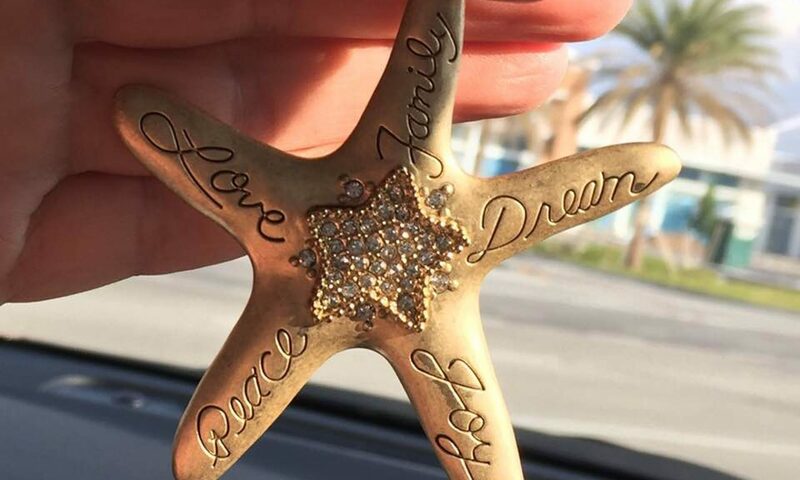 Perhaps they hold keys to our own origin and even destiny? All eclipses are aligned with either the North or the South node. The North Node is considered to be where we are heading and the South Node where we have come from. This Eclipse is aligned with, or conjunct, the South Node, representing the past in some way. This suggests that indeed it could be bringing to our awareness, out of our deep memory (Cancer does rule our memories), our ancient past and original purpose. So is this Eclipse an opening to us consciously remembering our true purpose for being alive at this time? Could it be a call from our ancient past to our present to wake up and remember who we are? Will there be openings during this time allowing greater unification with our Higher Self? “There are billions of Souls wanting to incarnate at this time. That the energies of this Solar Eclipse and the other Cardinal influences occurring now are designed to activate our ancient memories so that we can see and know that our true destiny is to be here now, in our bodies, on the Earth at this powerful time of accelerated planetary and Soul evolution. This activation will decrease our egoic resistance, which will assist us to align our lower will with our higher will, plus bring us the insights needed to move our life in this direction. if we are not aware of and able to utilize the power and resources our Soul brings us. We are not doing this alone…to do so is exhausting indeed. What a privilege to be here, incarnated, at this time. The words of my Grandfather have more meaning to me now than ever. To open to this energy, start by simply being in the awe at the wonder of it all. *The quotes by Dane Rudhyar in the article are from “New Mansions for New Men”. In it, he refers to the fourth house, ruled by Cancer, as “the fourth mansion”. Love is a latent interior “hunger” we all feel through our longing to know — deeply — someone or something to which we are drawn. And Love understands that whatever we will agree to draw near to ensures — given time — we will come to know it; and then, transformed by Her magic through a marriage of a sort, we become as one with what was once unknown to us. Don’t think this too strange an idea. The hidden Principle of Love is that only through Her do we find in the object of our affection something of ourselves: that proverbial missing piece of the perennially empty heart. If we want to receive love we have to give it. What this means is that we must journey to Her before She will consent to be known. This is the courtship Love requires of those who long to possess Her. Of course it’s mysterious, but who doesn’t love a mystery! Whatever impressions you may feel from this sincere inquiry are the invisible magnetic impulses of a secret Heart, a pulse of Love that has been buried in you beneath layers — perhaps lifetimes — of misdirection. That is why you must take the next few instructions to heart. Never mind if you are attracted to something but feel unable to start because you are afraid of failing in your quest. Be assured of this: Whatever it may be that you are drawn to know — whether it is to learn a new skill, grow a flower garden, develop an artistic skill, to help others, design clothes or cars, or set out towards a deeper interior life whose center is Love Herself — I tell you the only thing that matters is that you just start! You can’t know this yet, but it is Love that calls you to Her side for whatever is your eventual choosing, and it is Love within you that feels this drawing. So do you know what this means? Just consider: Love will not, cannot fail Herself. It is more likely the sun would fall from the sky than for Love not to begin to shine through your nascent efforts. Your first reward will be to feel the warmth of knowing you are nearing the beginning of a whole New Life. Forget what others may think of you for your new aim to do your heart’s desire. Disregard those whose reality is a rut! Misery wants company. Do Love’s bidding instead. Persist with your working wish and Love will grant you the company of Herself. And as you gradually draw nearer to Her side you will know that nothing anyone thinks towards you could possibly add one cubit to your stature. Brush aside any concerns you have (for whatever the reasons) of being unable to make a “big” beginning. Just start where you are and with what you have — even if this means taking a step so small that not one person on earth notices you have just left one world and entered another. Any beginning that you will make for the sake of answering the call of your heart is the same as a beginning whose happy ending already resides right within that same initial action. Do what you must to make time and you will see that the energy you need to succeed will be given to you. Love lends her force to the entire universe, so don’t you think that if you were to ask rightly for a bit of it — for Her sake — that She would give you the measure you need? Of course She will! All you need do is just make some time, give some moments to your intended journey. Even if all you can muster to get started with is two minutes a day, just place your attention on what you want to love, and it will love you back by giving you a bit of itself. Persist with this new Work until you see — which you will if only you will stay the course — that the love you thought you had chosen was really Love choosing you. And when at last you realize that it has always been this way, then, for you, it will always be so… until the end of time. How may you be assured that all of this is True? Previous PostPrevious Jo Dunning, a tap-along on moving forward, astrology updates, and making toothpaste. What an interesting mix!